Douglas Ramsay Custom Cabinetry in Pompano Beach, Fla., never needed to advertise and enjoyed a five-month waiting list because of glowing customer referrals. Business was so good, the shop turned down smaller jobs and if the phone rang too much, the company would raise its prices 10 percent. But then the housing market began its downward spiral compounded with the recent economic downturn. Doug and Kelly Ramsay found themselves in uncharted territory. "This is a new market and we have to be more flexible," says Kelly. "We are in a luxury business and if someone is struggling to make their house payment, they wouldn't be interested in spending $8,000 to $12,000 for a custom wall unit." Because the market has changed, the Ramsays have altered how they close a sale. Doug now produces drawings before a sale is closed, something he never did in the past. "We are finding more and more that he needs to draw to generate enthusiasm to get the client to proceed with a project," says Kelly. Until a few months ago, Doug provided a rough sketch and once a contract was signed, he would produce detailed hand drawings. "In the era of free, no obligation kitchen CAD drawings from big box stores, we are going out of our way to get every contract," says co-owner Doug Ramsay. The shop's lead time is now averaging 14 to 18 weeks, which is just fine for the Ramsays. "The average lead time for South Florida is six to eight weeks. When we were at 26 weeks we were losing a lot of business because some clients didn't want to wait," says Kelly. "Now we're more competitive." The long lead times also forced Doug to work grueling hours to meet deadlines. "When we quote someone a date, we'll work night and day to make sure it's done on time," says Kelly. "We want our word to mean something." Both Kelly and Doug spend at least two hours a week following up on leads, and he is now accepting smaller jobs. "Two years ago we probably wouldn't have accepted a job for one bathroom vanity because we were so busy," says Doug. "Now, those small projects can turn into larger jobs." Adapting to a new economy also means pricing more competitively. "In December I met with a homeowner who wanted to remodel a 12-by-20-foot home office. The client wanted wall paneling, two full computer stations and a peninsula desk," says Doug. "Normally we would charge $20,000, but that week we hadn't sold anything, so I quoted her $13,000. I decided I'd rather make a little money than nothing. She said she wanted everything for $5,000.There's a perception of blood in the water and customers are trying to offer half the market price." Needless to say, he declined the job. After being in business for 22 years, the Ramsays have learned you have to quickly adapt and never count on the work being there. "One thing we've learned over the years is to keep your overheard to an absolute minimum," he says. Because of the shop's varied job scope, purchasing machinery hasn't been an option. "The complexity of every job is so different that the kind of system where everything is integrated from CAD to CNC is in the $750,000 range and as far as return on investment we're too small for that," says Doug. "CAD works if you're doing mostly kitchens and we do some, but we also do many other projects that aren't standardized. I can draft those faster on an isometric pad." The shop doesn't rely on expensive machinery like a CNC machine, which requires Doug and his one full-time employee, Yovany, to come up with creative timesavers to reduce work time. They have created more than 40 jigs for repetitive jobs, such as fluting columns. "The jig holds a router and uses a gigantic dovetail joint and some hinges to allow a router to travel along 12 feet to cut the fluting in vertical columns," says Doug. 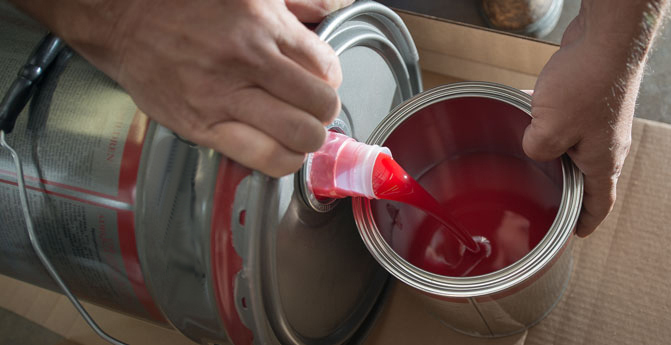 "It cuts the time in half and if set up properly it's practically mistake proof." Because the shop edgebands about 10 boards every three days, investing in an edgebander isn't practical. As a result, Doug edgebands boards with a $6 iron and a razor blade on a stick. 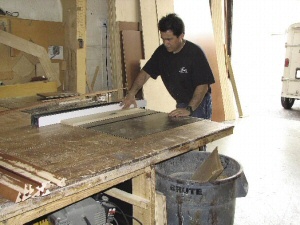 If Doug is out of the shop installing a project, Yovany created a large door hanging jig to keep work flowing. "By using this jig, a two-man job can be done safely with one person," says Doug. Instead of investing in a line boring machine, Doug uses a piece of scrap quarter inch and cuts little slits into it to make adjustable shelving for kitchen cabinets. "We make jigs for every job, but for repetitive tasks we build those to last," he says. "To stay in business we have to be as lean as possible." Installs are practically flawless because all projects are built with the installation in mind instead of building a piece to make it easy for the cabinetmaker. During busy times, Kelly becomes a third set of hands. "In the past, we've employed as many as 12 people," says Doug. "I was paying men double time to fix their mistakes. It doesn't take a Harvard graduate to realize that's bad business." For most jobs, Doug assembles and reassembles a project three times. While at first this may seem like a huge waste of time, he's found it to be a timesaver during installations. "Most wall units are vertical columns with boxes in between, so we build the columns, any bridges and put it together," says Doug. "If we need crown moulding we put that on as well. We loosely put it together once the color is on to make sure it's consistent and it's reassembled a second time after the final finish and the doors are installed." The piece is assembled for the third time when it's installed in the customer's home. "The piece is like a gigantic puzzle and breaks apart into pieces one person can lift and transport," he says. "Once it's put together it looks like it was built onsite. We do bring extra scribes or moulding in case the walls are out." "By managing the workflow in this way, we don't have to do any work at the client's home and we never have any surprises," says Doug. "Installs are fastfour hours for a wall unit and one day for an entire kitchen." The shop's main business is now coming from wealthy "snowbirds" who escape to Florida during the winter months. "The retirees want their homes to be beautiful with up-to-date kitchens, home offices and custom wall units," says Doug. The shop uses A1 plywood and about 90 percent of clients request maple. Wall units for flat screen TVs are requested the most, but some clients are opting for more contemporary-style credenzas, comments Kelly. "Design trends are shifting back to what clients requested in the mid 1980s," says Doug. "Clients want very contemporary looking pieces with curves and radiuses and simple lines. However, crown moulding and fancy carvings are still popular too." Regardless of economic woes, the Ramsays are constantly challenged to stay small and tight without compromising quality. 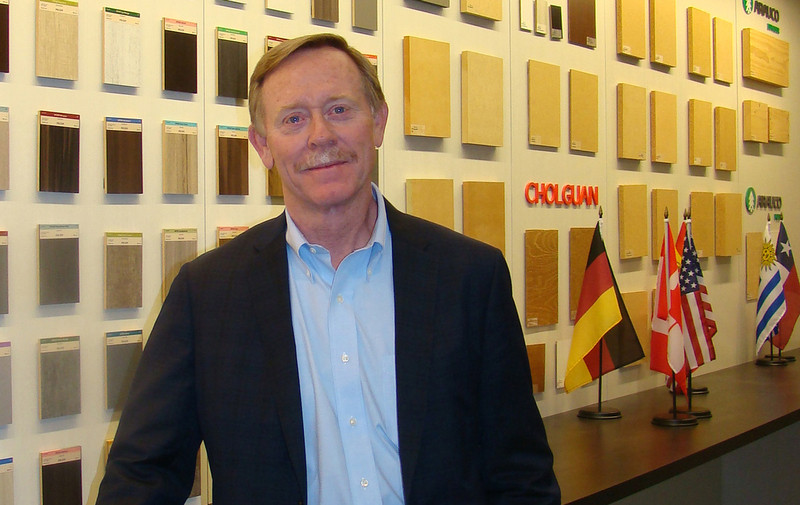 "We're in a comfortable niche because I monitor quality control over everything that leaves the shop," says Doug. "I have the right number of employees and as long as we're able to pay our bills, we don't want to make too much profit either."